Wow I love these feathers. It makes me feel happy if I am out walking and I find an unusual feather. These are grand. I very much love your site. Disappointed today to see the black background. The white made the pictures seem more expansive. i love those feathers! oh wow sooooo pretty! 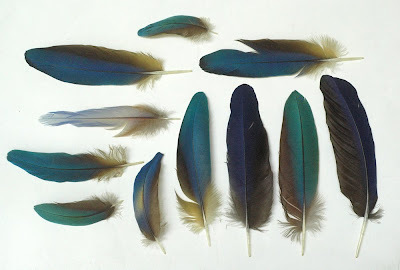 My sister and I used to collect all kinds of feathers, whatever we could find when we went on vacation. My aunt saved them all for us in a shoe box. oh my goodness -- what bird left these behind? so beautiful. I love the feathers. I also collect,feed the wild birds so have the ability to find quite a few different kinds.Also beach good place. I love these! Where on Earth did you find them?